Everybody will say. The key to being a writer is … write. Don’t talk about it at parties, or on social media. Just write. At first possibly we all want to write the bestseller. One book that means we never have to work again. It didn’t happen for me, and I suspect it won’t happen for you. Writing is a craft and we have to learn as we go. My suggestion is try a few short stories. 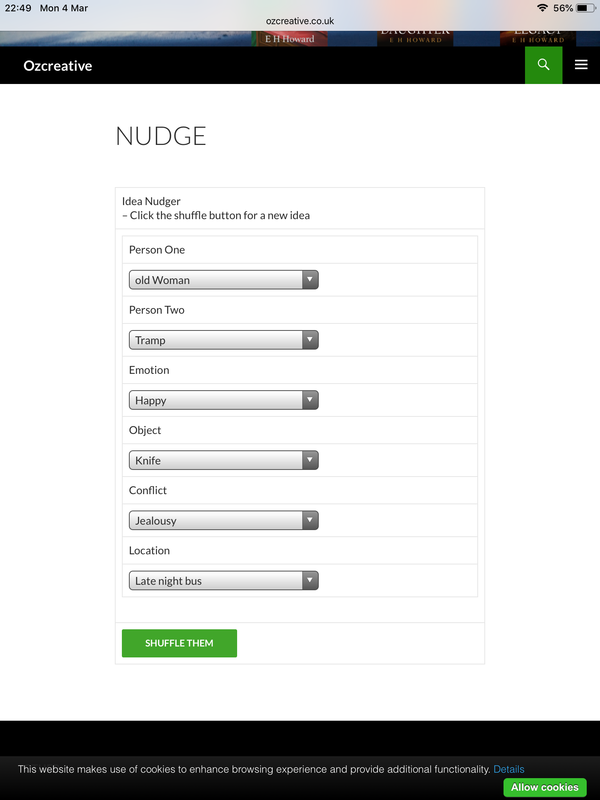 You could do worse than look at the nudge page and see if you can get a short story, say a thousand words based on a choice. By taking a set of prompts, I often find I can pull something together. Remember, the first ingredient is conflict. As is the second and third. It is conflict that keeps a reader reading. How do we do that? Got inspired and decided to start the blog up … again! Hoping to cover writing, life, coding and probably trips to my beloved Greece and beyond. I have used a different technique to write ‘Amara’s Destiny’. 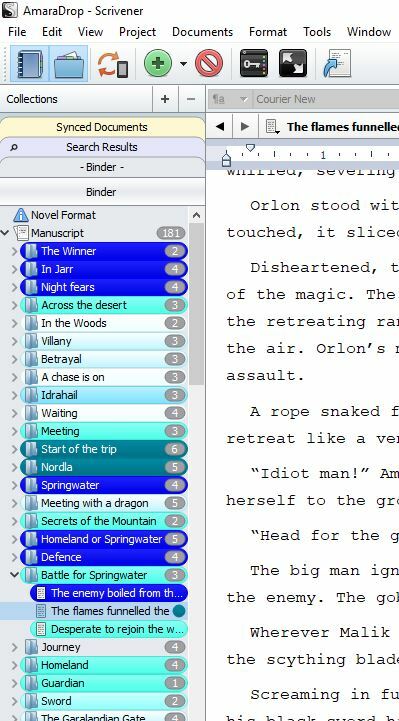 An author friend I trust uses the technique of looping back to the beginning every 10k words. Although I started to hate the characters I have done it and liked the result. However, the looping back on a 100k novel means whilst the front of the story gets edited ten times, the tail of the writing is quite new. Also when I realised a major change had to occur, such as, completely removing one character, I had to go back to amend ‘well-edited’ scenes. I write each scene as a separate section, with a folder for each chapter. What I came up with was colour-coding each scene. It starts white, and gradually progresses to dark blue, at the moment this is a seven option grading. The whole chapter is set to reflect the colour of the lowest scene within it. If I do a major edit, I knock the colour/ status back. I hope this will show me how well edited I think it is before I submit to the professional editor. Who will rip it apart and kick every chapter back to first draft status! It all started as a bit of a joke. I love to read to my grandkids when they stay over. I read out loud and they quickly fade under the lilting (or boring) tones. This was part of the inspiration for writing Pog, I wanted a book I could read to them. So when my daughter joked about recording my voice, I nibbled and then bit. Now I’m addicted to the task. First version was easy. But then I noticed the breathing noises. Can’t have breathing. Then the mouth pops. Who knew I I couldn’t speak without being so noisy? Then, I recorded three chapters over in Wales. They sounded good, possibly the best I had done, but they also sounded … different. The whole timbre and tone was not the same as recording in my office. I decided to press on and come back to them later, but they kept niggling. So four weeks on and am still cutting the first chapters. 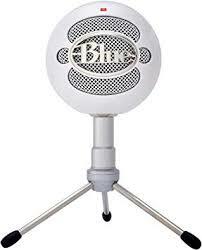 I have bought a new microphone. The internet is full of articles about microphone techniques. Some say get really close to the microphone to cut out the room echo. Others say back away from the microphone to get rid of the mouth pops. I suspect it is one of those things professionals get to learn. Another said fill the room with soft cushions, whilst one said they recorded with a blanket draped over them. I tried the blanket thing. One, it gets hot and two, it is impossible to control a mouse a keyboard and read from a screen whilst fighting a blanket! I was told that when I was writing, to seek for the third idea. It’s not an original suggestion, in honesty I have no idea where I first heard it. The fact is that for me, it seems the only way to reach for the original twist (If there is such a thing.) My first few ideas are usually old hat and cliched. I recently considered a short story competition. A call out for tales of the end of the world. Not, a fantasy, a real life, could happen style wrapping up of things. It coincided with seeing a meme about the bees. 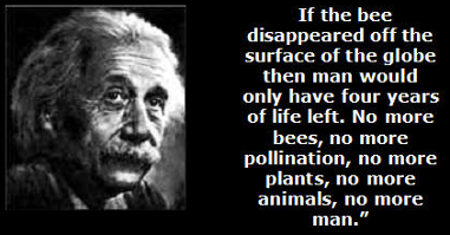 Now, my cynical head says, why would Einstein know about bees? He did maths and physics. AND nobody can actually attribute the statement to him. Sounds good. However, a niggle says that HG Wells might have beaten me to it. I recall a short story, I think spiders slowly emerging from the rain forests (Oh, rain forests, save that idea as well.) Then I also remember Frank Herbert (Dune), he wrote The Green Brain – insects fighting a terrorist war against humans. So, how do the bees get into the population? Obviously, an activist releases them … planet of the apes, 28 days, possibly a dozen others I haven’t yet recalled or seen. What if the scientist becomes taken over by the insects. Time to walk the dogs, stroll in the sea and let my head roam free. Sadly, its too hot to walk the dogs and I’m currently in Crewe where the sea is a long way off. Possibly not every twist, but certainly a lot of them come by discarding the first couple of scenarios. Currently, Amara is fighting for her life. It’s the last big battle of ten years of writing. Should it really end with her simply being better than her foe? Could it end with her impaled on a spear? Maybe she woke up and it was all a dream. Started playing around with ideas. Hoping to create a kind of Aesop’s fables. Tales that aren’t too long for a single telling and hopefully carry a moral that can be discussed. Shirl the Smith is possibly the only book ever written in Serenia. It is the tale of a girl expected to become a warrior, but instead becomes a Smith and travels the world of Shudalandia. Once the first full draft of Amara’s Destiny is complete, I hope to take ‘How Shirl Became A Smith’ all the way to a released short story. Certainly this should be before Christmas. Is this really Shirl in the picture? At the moment, I’m not sure. I am doodling a few characters, but I think this is close. 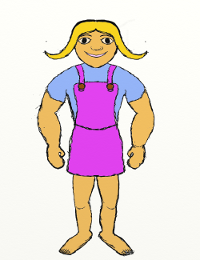 Maybe she’ll start off with thinner arms and legs and bulk up as the book progresses. Amara? Is coming together really well. I have a beginning, middle and end. Nail-biting, tear-jerking and hopefully a couple of big surprises. Of course Narnia is recognised as poorly veiled Christian theology. However, it was many years before I became aware of this and by then, I loved the stories sufficiently to forgive this indiscretion. Pog isn’t the same. Yes, it has a spiritual underpinning, but rather than offering answers, Pog is intended to promote questions. (a) to write a really good story with a young boy as the protagonist. So shoot me, I have seven grandsons, I wanted each and every one of them to imagine the story was written about them. (b) To write something that could, (if a parent/ guardian/ care giver/ teacher, wanted to,) be used to discuss spiritual ideas. Is it really a surprise that the amour is faith? I don’t believe this is a concept tied to a specific religion, but should work for any. To make up for having a boy protagonist, I did create Jazz. This crazy little girl turned into my favourite female character. She really wasn’t meant to play such a big part. Brad was the captain, Sal the juggler/ thrower of things and Jazz would be there to run as needed. How hard can that be? But once she was on the page, she got cheeky. Being closest in age to Pog, she got him into trouble. From the point where she crashed out of her parent’s house she demanded more attention. So, I think I ended up with a sufficiently strong female in the tale to balance it out nicely. Over the next few weeks I hope to reveal some of the things readers might not have spotted. I am so bad at the marketing awareness thing. A couple of lovely reviews posted in March and I have only just checked them. Pog and the King’s Armour is my first children’s book. 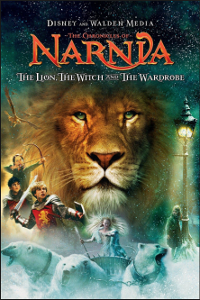 Although it is for children, it is really aimed at anybody who loved Narnia books. It is so good to get a review where somebody really does like reading what I have created. More than makes my day. Thank you! 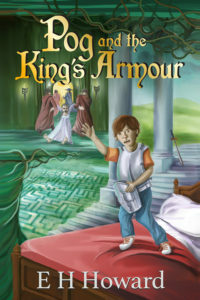 Pog and the King’s Armour is the first children’s book I have written. Many people suggested I should write for children (my childlike mind, maybe?) Many of my favourite books fall into the children’s category. Harry Potter, Narnia, Winnie the Pooh, Wind in The Willows, etc. The list goes on. Writing for children is about pushing into a crowded market. Every celebrity on the planet attempts it. There are classics every parent wants their child to love. Is it possible to stand out in such a market? I’d say it’s a retro-style book. It’s not full of wacky pictures or different ways to giggle at poo. 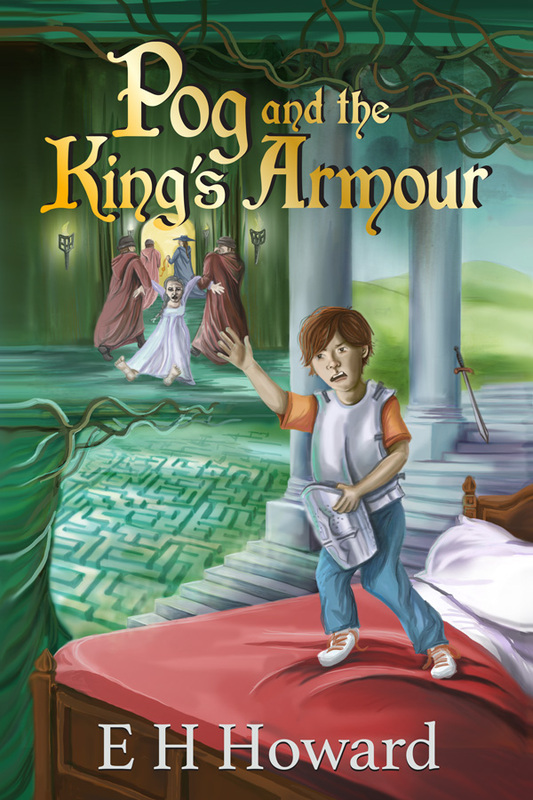 Pog and the King’s Armour is a great story written using a sensible vocabulary aimed squarely at self-reading children between 8-10 years old, or adults who have discovered the joy of reading to children. If you read, and want to engage children in reading, you have to look at this book. The games in Pog are memories of games we played on the street outside our homes. The looming monument in the centre of Stanton is the Corona cinema on the corner of Radstock road. 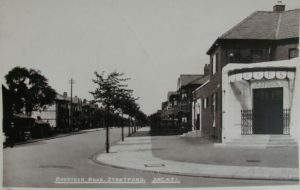 Looking at the black and white picture of the cinema in its hey-day, I find it hard to believe how those steps towered above me. The guardian at the top peered down on the line of children below. Each child stood frozen, waiting for the chance to edge closer. The guardian at the top of the steps had to turn their back and cover their face. After a short count they could then turn around and try to spot somebody moving. From tea-time to bed-time the evening flew past. To a dozen kids, the steps of the closed-down cinema were our playground. Part of what I wanted to create with Pog was the pleasure of playing games, physical games where the players jostled for position; ran jumped and froze. We didn’t have goddesses gleaned from mythology. We had big sisters and younger brothers. Some grew too old to want to play, others came and went. Those steps, that time – magical.